I’m not an expert on films which occasionally causes me to get extremely confused when I have to choose one out of so many. Director Martin Koolhoven (Schnitzelparadijs, Oorlogswinter a.o.) and ‘expert’ Ronald Simons (thecultcorner.com, collection specialist at EYE film) have simplified this for me by organizing a monthly programme in the Balie called “Cinema Egzotik”. During these nights, Martin Koolhoven and Ronald Simons alternately choose two of their favourite movies which are then projected off 35mm films. We did a short interview with them. Both film experts agree that there just isn’t enough attention for lesser known films which don’t originate from Hollywood. There are plenty of films available, but unfortunately, not enough available locations and/or a big enough audience attracted to these movies. In addition, Simons emphasizes that he would like to see more special previews where directors or screenwriters are invited to introduce the films and provide it with the necessary context. The second edition of Cinema Egzotik will take place this Thursday with a “Vietnam” theme. 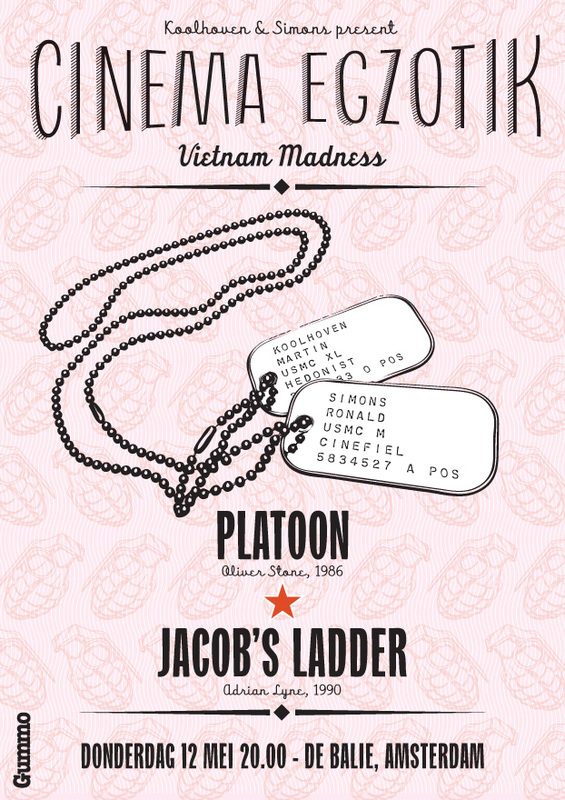 Ronald Simons has chosen two movies this month; the evening kick-off will be with “Platoon” by Oliver Stone followed by Jacob’s Ladder which will be introduced by writer Hafid Bouazza. These two movies have both been made financially possible by Frans Afman who passed away last week. This month’s Egzotik will therefore also include a small tribute to Frans Afman.